A newly discovered photograph reveals J.R.R. Tolkien at fifteen in his school’s new cadet corps—launched in 1907 as nations geared up for war. Tolkien is one of some 120 unnamed figures in the picture, unearthed by the history department at King Edward’s School, Birmingham. School archivist Alison Wheatley managed to pick his face out of the crowd. The image appears here at a higher resolution for the first time. 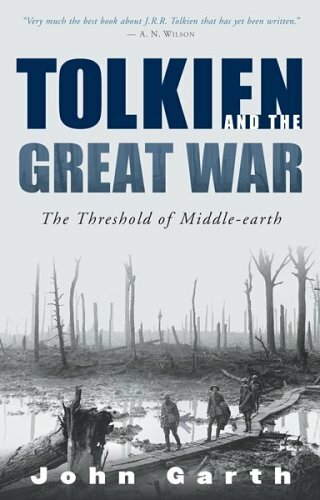 A low-resolution version was published last week by the Birmingham Mail and the BBC in reference to a radio item about Tolkien and the First World War. Ambiguous captioning gave the impression that this might show Tolkien with the 11th Lancashire Fusiliers, the battalion he fought in at the Battle of the Somme in 1916; or that it could be soldiers formerly from the school but pictured during or after the war. 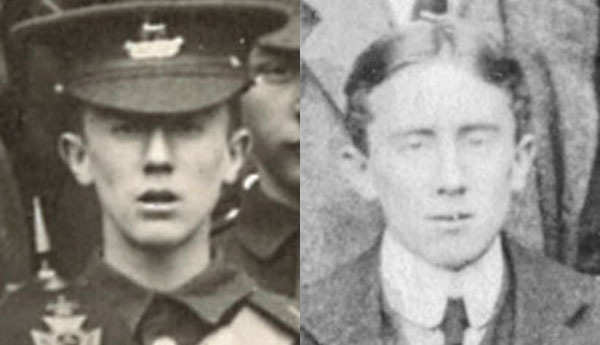 Some readers observed that these are clearly boys, not men, and that Tolkien looked far older when he went to war at 24; he also wore quite a different uniform, and (in accordance with military regulations) he had grown a moustache. 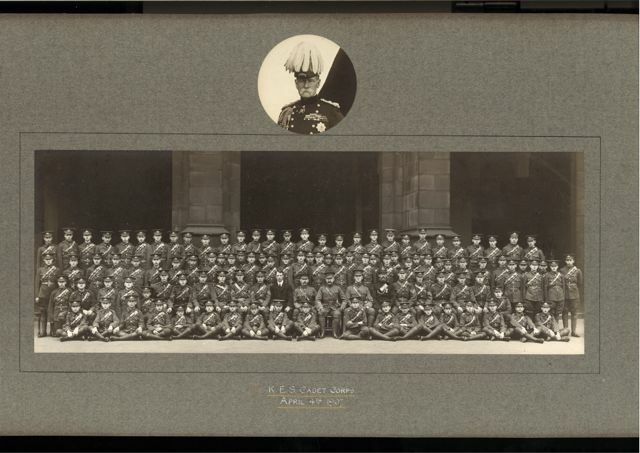 So I am pleased to be able to confirm that the photograph was taken on 4 April 1907, and shows the King Edward’s School Cadet Corps when it was newly formed, arrayed for inspection by Field-Marshal Earl Roberts. I agree with Alison Wheatley in identifying Tolkien in this rather anonymising picture. Apart from anything else, his slightly lopsided ears give it away. Petty details assume a peculiar importance when you are trying to match people between different photographs. The school records show that Tolkien was a corporal in the Officer Training Corps (as the Cadet Corps soon became known) for his final academic year, 1910–11. Prior to that he was presumably a private, but boys of that rank were not listed. The long wished for Cadet Corps is at last an accomplished fact. The War Office decided, after many weary weeks of waiting, to consent to the formation of one Company. Long before this appears in print the sounds of musketry will have been heard echoing through the cloisters, and the stentorian tones of the drill instructors will have filled the playground. The visit of Lord Roberts is reported in the April issue as “the chief event of the present term”. The original purpose of his coming was the inspection of the new Cadet Corps; but an address in Big School [a huge classroom] was also included in the programme. By 3.45 the cadets were ranged up in two lines in the playground, whilst upstairs Big School was packed, almost to suffocation, with an expectant multitude…. At 3.50 loud cheers in the street outside announced the arrival of Earl Roberts, who immediately proceeded to the playground and there inspected the warriors-to-be: these, we believe, showed to great advantage in their (somewhat painfully) new uniforms. “Warriors-to-be” was not some innocent fiction. The formation of the cadet corps was a sign of the times—an era when Britain, the established imperial power, was engaged in an arms race with Germany, a state which had not existed before 1871. The corps was set up at King Edward’s School just as the British government was looking into ways of ensuring a supply of officers if war broke out. In 1908, all such school units came under the administration of the War Office. In Tolkien and the Great War I say more about the school’s Officer Training Corps and what Tolkien did in it while the drumbeat of war quickened. 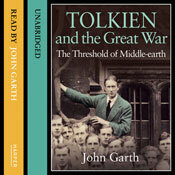 But even in 1907, Tolkien’s generation was already on the road to the trenches. As The Times reported Lord Roberts’ speech to the school that day, “he wanted to see every able-bodied boy learn to shoot his rifle with skill. He wanted every boy to understand that not only was it his bounden duty but an honour and a privilege to defend his country”. The irony is that so many future volunteers and conscripts in the Great War—including men we see in boyhood in this 1907 photograph—were mown down in 1914–18 because they were ordered across No Man’s Land exactly as if crossing the barrack square, in the face of machine guns far more deadly than rifles. Those men included the headmaster’s own son, Robert Quilter Gilson, a close friend of Tolkien’s, killed on the first day of the Somme. His platoon commander recalled: “My very last memory of the attack is the sight of Gilson in front of me, and CSM Brooks on my right, both moving as if on parade, and both a minute or two later to be mortally hit” (my italics; quoted in C.C.R. Murphy’s 1928 History of the Suffolk Regiment). While researching Tolkien and the Great War, I spent many days at the British Library reading the King Edward’s School Chronicle and trying to form a picture of the young Tolkien and his friends as individuals. It was not a straightforward exercise, because boys’ school magazines like that tended to purvey either po-faced reports of official events, or else tongue-in-cheek banter. Nevertheless, as I read through the issues covering Tolkien’s time at the school and the years immediately after, a picture began to coalesce, Seurat-like, from the host of tiny details. It was not a picture like the formal one of the 1907 cadets in their painfully new uniforms, but an image of a jostling, exuberant, sometimes brilliant crowd of boys emerging from unremarked childhood into maturity and individuality. I followed the progress of Tolkien’s various circles—members of the rugby club, the literary and debating societies, and especially the thoroughly unofficial T.C.B.S. which came to mean so much to him, to Gilson, and to their friends Geoffrey Bache Smith and Christopher Wiseman. I watched boys win their first school prizes, have their weaknesses anatomised on the pitch, give vent to their oratory on topics from cinema to suffragism, share their passion for the Romantics or Arthurian literature, and go sailing on to Oxford or Cambridge, as if nothing could stop them. And so on, and on, and on, for four years. *Pictures reproduced with permission of the Governors of the Schools of King Edward VI in Birmingham. 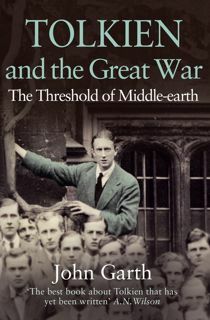 This entry was posted in 100 years of Middle-earth, Tolkien in the First World War and tagged First World War, King Edward's School, Tolkien's life. Bookmark the permalink. John, I’m not sure I wholly concur that the Haldane Reforms of the militia were part of a “drumbeat for war” or that the naval arms race with the Germans was part of years-long preparation for an expected clash. Rather, the committee’s recommendations were the result of a “lessons learned” analysis of what had gone wrong in the 2d Boer War, an affair which had rather embarrassed the Army, and its thinking was couched in terms of another midsized colonial war, not a major clash in Europe. Bill, thanks for your comment. My reference to Lord Roberts’ observations about the Boer rifle advantage bears out what you say about the “lessons learned” from the Boer War. I’m not suggesting that Britain was expecting a great European war, or was deliberately planning a war anywhere. There were rivalries between all the great powers, and predictions of war took any number of shapes. Some pooh-poohed the predictions as scaremongering; others felt it vital that Britain be ready if need be. In a chicken-and-egg situation, fear of war raised the international temperature. The naval arms race and other factors contributed to the packing of the European powder keg. The question now is, are any other members of the TCBS in the photo? Can they be identified? I think that will be possible, Timothy, but a challenge is posed by the paucity of photographs of some members (G.B. Smith in particular), and by those anonymising uniforms. It has already been suggested by several people that the figure to the left of Tolkien and in the same row could be Christopher Wiseman. I’ve never seen him pictured with an expression like that, but perhaps that was his attempt at a parade-ground look. The jury’s out at the moment. Brilliant, as always! Thanks, John! Forgive me if this is a stupid question, but someone someplace else asked it and I thought it was worth knowing the answer: is the gentleman with the spiked helmet and iron cross in the front row of the close up picture wearing a German uniform? Doug, in the wake of the Franco-Prussian war of 1870, suddenly the Prussian Army rather than the Napoleonic became the model which everyone wanted to emulate, and versions of the Pickelhaube became ubiquitous; even the US Army wore them for a while. The British Household Cavalry still wear them today. (Another influence was the Prussian ‘Waffenrock’ blouse, still worn, slightly modified, as a dress uniform tunic by the Foot Guards and the US Marines. 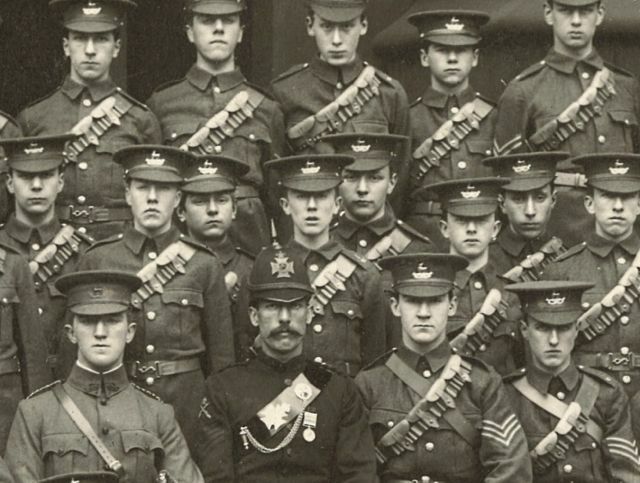 Incidentally, the officer at lower left is wearing, logically enough, the cap badge of the Royal Warwickshires. The OTC badge seems to have borrowed the couched stag from it. The “Iron Cross” appears to be, though it’s hard to tell in this photo, at least very similar to the cap/helmet badge of the King’s Royal Rifle Corps. On the bandoliers: These appear to be a modified version of the Cartridge Belt, Mounted Infantry,* Pattern 1882 (or 1888). The two were identical except that the former had larger loops for the Martini-Henry .450/577 cartridge, and the latter smaller loops for the Lee-Metford/Long Lee-Enfield .303. From this photo I can’t really tell which; either might be possible for an OTC unit. The Regular Army had by 1907 adopted the Short Magazine Lee-Enfield (SMLE), which was loaded from charger clips and had a very different (Pattern 1903) cartridge belt. However, standard-issue P82/88 bandoliers had long cover-flaps, each spanning 10 cartridge loops and secured by two hold-down straps each. These bandoliers appear to have been altered by splitting the flaps in two in either a 5+5 or 6+4 pattern (depending on whether they were originally Mk I or Mk II variants). *Although introduced for horse troopers, the bandoliers proved so practical, as opposed to hip cartridge boxes, during the Boer War that most infantry adopted them as well. John , does your library cast any light on who the gentleman in the helmet might be? If the staff of the OTC aren’t listed by name, one might look among the faculty or school staff for a veteran NCO who had been on foreign service (based on the campaign gong he’s wearing) and who had left the Army in the early 1890s. My inner Sherlock Holmes is saying a colour-sergeant of the 3rd Battalion, King’s Royal Rifles who saw action in the Egyptian campaign of 1882-84. OK, John- I realize your interest in the Man in the Helmet probably ranges somewhere between ‘minuscule’ and ‘infinitesimal,’ but he piqued my curiosity because he stands out, and he actually provides a little window into British citizen-soldier arrangements in the leadup to WWI. He is wearing the uniform of a Sergeant-Instructor of the Birmingham Volunteer Rifles, a corps which within just a few months would be re-organized as the 1st Volunteer Battalion, Royal Warwickshire Regiment. The Volunteers, created by an Act of Parliament in 1859, occupied a status superior to the Militia and on a par with the mounted Yeomanry; in 1908 the latter two would be amalgamated as the Territorial Force and integrated as battalions within Regular regiments. The membership tended to middle-class or prosperous tradesmen (as opposed to the laborers etc of the militia), since they had to buy their own kit and weren’t paid except for training or when actually called out “in the event of invasion or insurrection, or the appearance of an enemy force on the coast.” Paying for their own uniforms tended to result in hanging on to styles which were decidedly out of date, as in this picture. With the Childers Reforms in 1881 the Volunteer corps were ‘affiliated’ with regular regiments; in the case of the BVR this was the 60th Foot (King’s Royal Rifle Corps), and so the uniform adopted then was based on the latter, albeit without the costly piping and frogging. It was of course Rifle green with black accoutrements (as opposed to the red and white of the Line), and officers and warrant officers wore the distinctive Rifles cross-belt that our Helmet Man sports. Their badge, worn as a helmet and belt plate, was the Bath-Cross-with-crown of the KRRC but without the battle honors of the 60th. 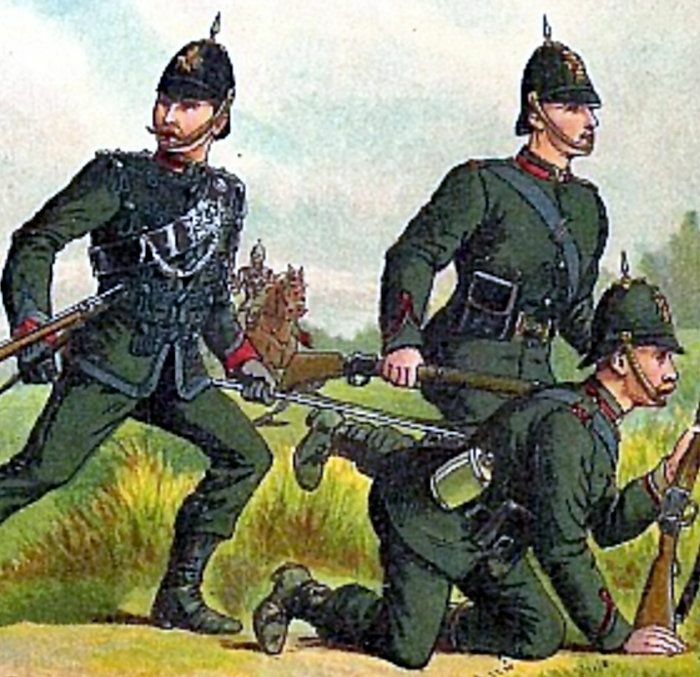 The assemblage is very 1880s in style; the KRRC had abandoned the German-style helmet in 1892, and while they still retained Rifle green dress uniforms, by 1907 they like the rest of the Regular Army had adopted everyday service uniforms in olive-khaki like the others in the photo are wearing. Our man is wearing sergeant’s chevrons on his right sleeve (you have to look closely because they are indistinct, black on a dull-red backing), and above them the crossed-rifles-with-crown of a musketry instructor. This I think explains the cross-belt, ordinarily only worn by officers and warrant officers (ie the RSM and RQMS); Sergeants-Instructor were authorized to wear swords on parade. I would venture then that Helmet Man was brought onto the KES OTC staff as a shooting instructor; some of the TCBS, notably Payton, proved to be quite good shots and Tolkien wasn’t bad. “A Captain’s commission in 1st V.B. Royal Warwickshire Regiment has already been, or will shortly be granted to Mr. Hume, who will be the commanding officer. Mr. Hume has for many years been an ardent worker towards the formation of a corps at King Edward’s, and the whole School is greatly indebted to him for his untiring zeal and unflagging energy. He was for some years a member of the Edinburgh University Corps, and so is by no means inexperienced in the art and science of Volunteering. So, one potential officer of the 1st Battalion of the Royal Warwickshires, Mr Hume, and one musketry instructor, Mr Smith. I presume Mr Hume, though, is Helmet Man. 2) The NCO stripes of the BVR were not black on red backing but dark green on black backing, and therefore very hard to see. 3) Helmet Man is wearing a decoration which can’t be made out in this photo, but the medal and its clasps are the right shape to be the Queen’s South Africa Medal. If this is the case, as seems likely, it would make Helmet Man one of the 116 members of the BVR who went to South Africa in 1900 and fought (as the Volunteer Service Company, 2/RWR) at Pretoria, Diamond Hill and Belfast. Well, John, I’m not entirely sure; Helmet Man is an NCO, whereas Hume was or was shortly to be a commissioned officer, the other side of a class wall which had yet to be breached in England. Moreover Hume’s “experience in Volunteering” is said to be with Edinburgh OTC, and if he were a current member of the local Volunteers surely that would have been mentioned? If you have a hi-res version of the photo, you might look at the cuffs of the officer seated at center (with no cadet in front of him) and see if he’s wearing captain’s pips- if so, then he would probably be Hume. And here is the History of the 1st Volunteer Battalion, Royal Warwickshire Regiment… published in 1906, just barely too early to mention anything related to KES OTC. However, facing page 334 (e-text p. 411) is a plate showing the 1(V)/RWR’s uniform in 1906: still almost identical to that the KRRC had been wearing 20 years before. Coming back to re-read this, I realise more forcefully than at first (when it was all exciting new information) how powerful a spell you cast here if one allows oneself to stop and think.